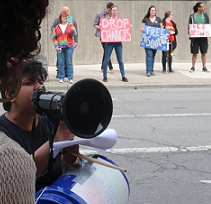 Over 50 people marched from Bicentennial Park to the Franklin County Juvenile Detention Center today to demand the release of Masonique Saunders, 17, who was incarcerated last December. Saunders is being charged with felony murder after Columbus police shot and killed her boyfriend, Julius Tate, in an undercover operation. Saunders was not involved in the murder. 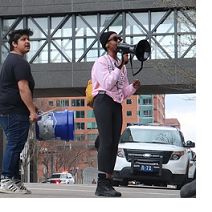 Singing and chanting, the marchers carried drums, instruments, and noisemakers so that they can be heard from inside the jail. 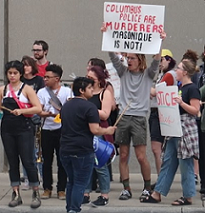 “Masonique did not murder Julius, the police did. 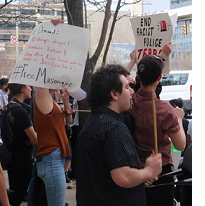 They need to be held accountable, she needs to be with her family and community in her home and school,” said Lainie Rini, a member of the Coalition to Free Masonique Saunders. Saunders has been in the Franklin County Juvenile Detention Center since last December. She has not been granted any bail. 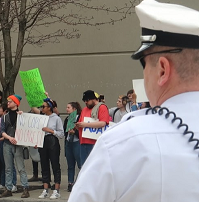 The Coalition has held actions and demonstrations for the past several months to demand the release of Saunders, including a sit-in in city prosecutor Ron O’Brien’s office last Monday. “We’re out here being loud enough so that Masonique knows on the inside that we’re out here fighting on the outside, and she is not alone. We’ll keep fighting until she is free. Our youth should be in schools, not prisons,” said J Harley, member of the Coalition. Saunders’ hearing was scheduled for early February, but was postponed and will be held in May.